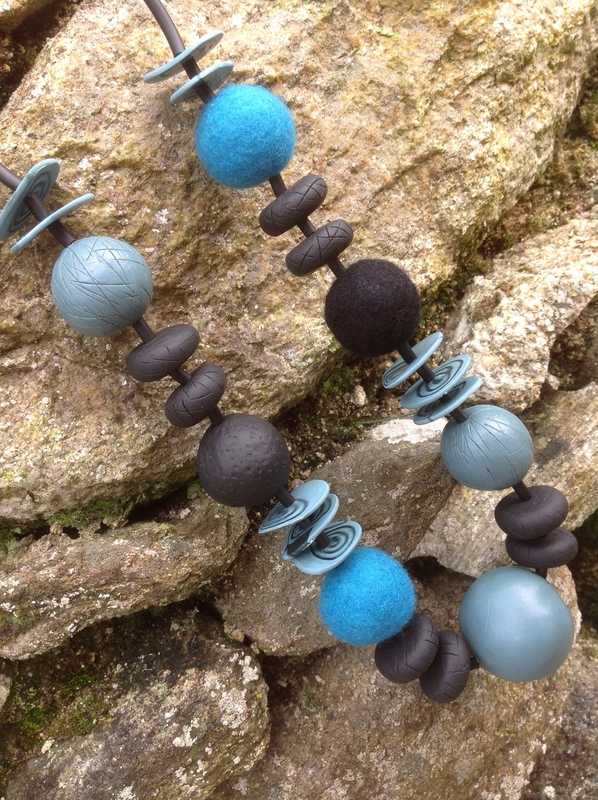 I finally finished my first 'official' felt and polymer clay necklace last night, I'm happy with some of its aspects and less happy with others. On the plus side of things I love the combination of textures, the soft organic shape of the beads, the smoothly burnished large polymer clay bead contrasting with the tactile felt beads, the black rubbery tubing I used to tie everything together with and I'm definitely happiest with the roughly textured polymer clay beads and the matt black spacers. I think that the finished necklace looks lovely against the textures of my recent nuno felt so I'm happy that I'll be able to create a collection of accessories that will add another dimension to my craft practice. On the negative side of things I'm least happy with how symmetrically I strung everything together, my only excuse is that I had a very limited selection of felt and polymer components to work with, hopefully that'll change as I get more pieces made and build up my stock of raw materials. I'm still waiting for my tissue blades to arrive so I'm a little limited with what I can do, the plus side of that is I have to keep experimenting and looking for ways around my lack of some decent cutting implements. I'd like to recommend Ronna Sarvas Weltman's book 'Ancient Modern' for anyone looking for clear basic instructions and wonderfully inspiring projects in polymer clay and wire jewellery. It's on special offer via the Interweave store up until 15th February at a knockdown price of $6.88 (usual price $22.95). I wish I'd known that before I ordered it elsewhere for the full price but it's wonderful value nonetheless! This entry was posted in Felt, Felt jewellery, Polymer Clay and tagged felt jewelery, felt jewellery, polymer clay, polymer clay jewellery, Ronna Sarvas Weltman by Nicola. Bookmark the permalink. From one felter to another: I love your blog. Mine is LizSeville@wordpress.com there is some interesting info on silver clay on a website here called George Weil. I love the contrast in textures. Can this material also be felted in eg as pebble shapes? Nicola….you are really on to something….the combination is fantastic….if this is a FIRST…..the sky is the limit to what you can do with the felt and fill. Huge thumbs up for you. I agree with Carole. I think this is wonderful. I love all the texture and the contrast between the polymer and felt. Very nice. All kidding aside…Your creations are always fantastic and this one is no exception. Being able to work with the clay give options for so many color combinations to add with various shapes of wool objects. Love the “rubber” tie. Great Job!!!!! Wow! 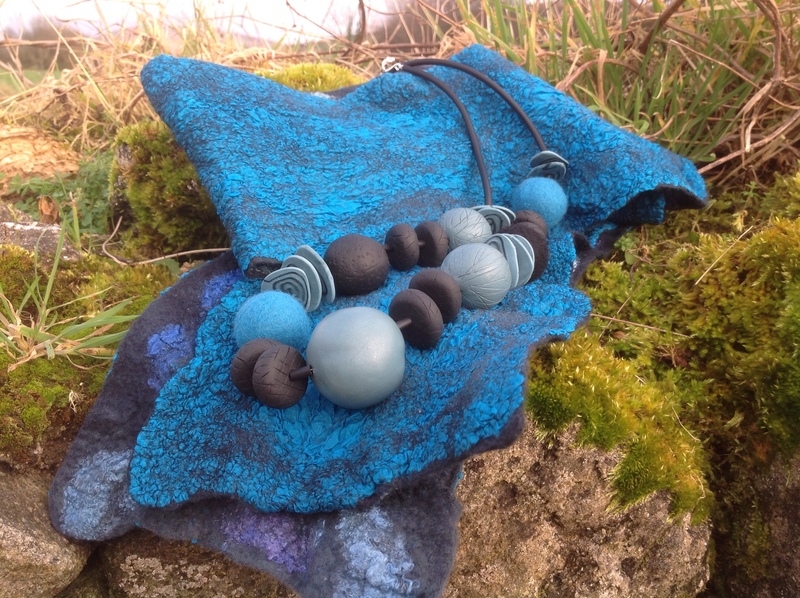 Your work with the fimo clay is truly inspiring, and ‘you’ve only just begun.’ Had thought about trying it to make focal points/details for hats…..but just stared at the hard, square blocks and thought ‘nah – how could this stuff work?’ But you’ve shown how lovely it contrasts the softness of felt.